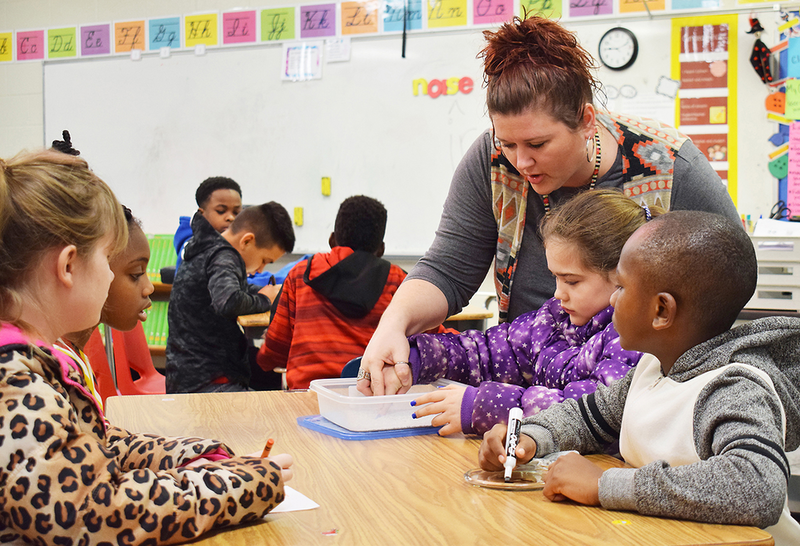 Bridgette Branson, a third grade teacher at Blytheville Elementary School, works with a few of her students, helping them to “feel” the sound as they learn certain parts of words. Branson and seven other BES teachers are trained in CONNECTIONS, which helps the students to spell words because their hands are “constantly touching and moving”, hence, remembering. Blytheville Elementary School students are learning phonics in a different way. CONNECTIONS, an Orton-Gillingham-based multi-sensory-structured language approach, stands apart from other O-G programs because it incorporates phonemic objects. By holding the object, which represents the sound the student is learning, he or she can actually “feel” the sound, helping the student make more connections to the brain for remembering that sound. CONNECTIONS also incorporates teaching sounds by smell and taste, senses that are often overlooked in multi-sensory programs. Eight BES staff members are trained in CONNECTIONS. Four third grade teachers, three interventionists and literacy instructional facilitator Cynthia McCustion completed a weeklong rigorous training with follow-up days, and one member of the BES Special Education Department is also highly trained in the approach. Staff members received their training from the Apple Group in Jonesboro. Sally Cooke, director of Curriculum for the district, pointed out that all teachers in K-2 use this approach in their classrooms; therefore, having the third grade at BES follow through with it was a natural step. She stated that the Arkansas Department of Education has made a push recently for every student in the state to learn to read with a focus on phonemic awareness. Among the lessons taught by the O-G approach include phonology and phonological awareness, sound-symbol association, syllable instruction, morphology, syntax and semantics. Bridgette Branson, a third grade teacher in her second year at BES, stated that CONNECTIONS training has been “extremely beneficial” for her. “I am very blessed to have had this training so early in my career and to be working with these students,” Branson said. McCustion also said “the excitement of Branson’s students when they are involved in CONNECTIONS activities is evidence in the progress they are making in their phonics development”. McCustion said Branson uses items such as sand to allow the students to spell words; their hands are constantly touching and moving, so McCustion said the students’ learning is easy to see. Branson followed up by saying “I tell my students the reason for touching, feeling and using our senses is because 90 percent of what we do, we will remember. If you do it, you will remember it,” she added.